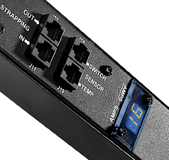 Designed for data centers needing remote site management, the Eaton Switched ePDU provides remote power monitoring of both voltage and current. The current is also displayed on a local two-digit current meter. These units also monitor both temperature and humidity.